Newark, CA -- March 23, 2012 –- KPI Partners, the 2011 Oracle Titan Award Winner for Business Intelligence Applications, announced today that two members of their organization have been selected to present at Collaborate12: Technology and Applications Forum for the Oracle Community, April 22-26, 2012 in Las Vegas, NV. Stephen Few designed the Bullet Graph as a way to display measurements vs. goals or other benchmarks. The screen shot below shows bullet charts in the column “MTD & Proj Comp MAgo” (Month to Date and Projected Expense Compared to Month Ago). Oracle Business Intelligence (BI) is designed to provide open, complete and integrated solution including dashboards, ad hoc query and analysis, score cards and enterprises. Some of the aspects offered include an expansive spectrum of embedded search, visualization options, mobile access and collaborative applications along with Microsoft Office integration. 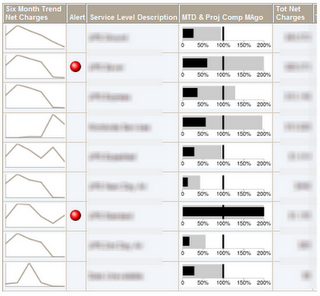 Users are afforded the ability to initiate most of these actions from a dashboard environment. highly scalable, architecturally unified technology foundation. 1. Defined repository security. Oracle Business Intelligence provides an administration tool that may be used to create groups and users with particular and specified permissions that are defined through certain types of authentication. Once the permissions are assigned, permissions are granted to specific groups and users. Privileges granted with exclusivity most often have precedence over group privileges. When conflict exits, privileges with least restrictions will apply. Adjustments are made in the NQSConfig.ini file to authenticate the database. Security section specifies the authentication database. Users are created in the repository which identical to those in the database. Database is imported to physical repository layer using the DSN of each particular database. For example, a connection pool may incorporate a non shared logon. The new connection pool is used to connect to the database. Upon connection, authentication has been effected successfully. 3. Lightweight Directory Access Protocol (LDAP) authentication. Many businesses, companies and enterprises have implemented LDAP server authentication as part of their Oracle Business Intelligence solution. One popular aspect of this is the Active Directory Service Interface (ADSI) for client projects. Assign parameters such as port no., host name, LDAP version (the default is 3), base DN and bind DN from the general settings. Define the settings in the Advanced tab by filling in aspects such as Connection Time-Out, Enable/Disable SSL and Domain Identifier. Create an LDAP initialization block, associated with the LDAP Server. Define USER as a system variable, mapped to LDAP uid. Alternatively, it is also possible to use the LDAP server exclusively to import group and user definitions. This scenario would be utilized if external authentication is not desired by LDAP. To connect to the db/table, created a new physical layer connection pool. Establish an initialization block with the newly defined connection pool for the table. Define initialization aspects such as the password, username, lognumber, and groupname from the auth_table where username = ':USER' and password = ':PASSWORD' is located). Define the corresponding variables (such as user, password, group, loglevel). Ensure that the variables order is identical to that of the initialize. The above describes some of the processes by which the extensive Oracle Business Intelligence solutions may be utilized for an effective security strategy. 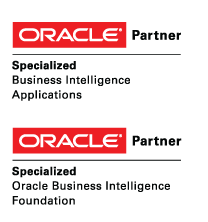 Newark, CA -- March 1, 2012 -- KPI Partners Inc., an Oracle Partner, is proud to announce that it has earned two specializations from Oracle for implementation services of Oracle Business Intelligence (BI) Foundation and Oracle Business Intelligence (BI) Applications. These specializations recognizes select Oracle partners with certified professionals who have demonstrated success in effectively implementing solutions using Oracle’s Business Intelligence Foundation and Oracle's Business Intelligence Applications which includes Oracle BI Enterprise Edition (OBIEE).